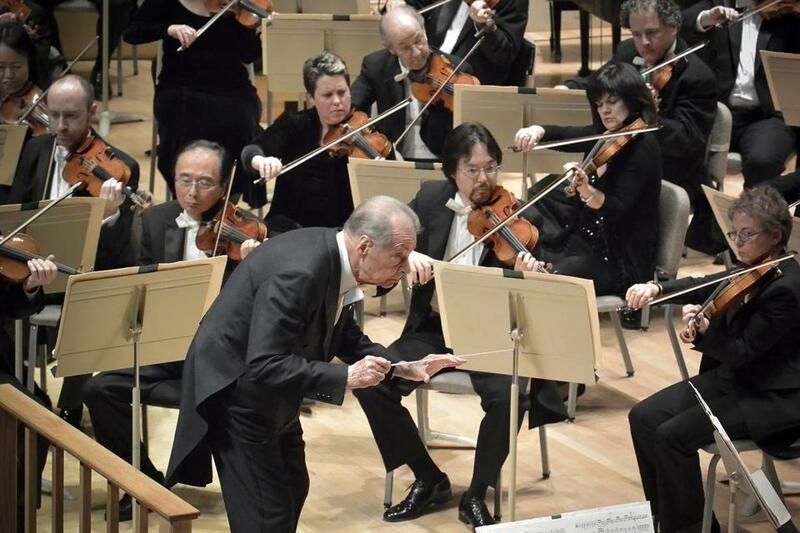 Rafael Frühbeck de Burgos, who has grappled with health issues in recent years, nevertheless was able to conduct a vigorous program at Symphony Hall. Think for a moment of the opening of Stravinsky’s “Rite of Spring,” or of Tchaikovsky’s Sixth Symphony. The sound of the solo bassoon drifts into the mind’s ear: woody, ancient, complex. Now — quickly — think of the last full-fledged bassoon concerto you heard. The ear draws a blank. This is the plight and paradox of the modern-day bassoonist: always in the middle of things yet seldom truly in the spotlight. The concerto repertoire for bassoon is miniscule, and the Boston Symphony Orchestra itself had not played a bassoon concerto in well over a decade. Until last night, that is, when principal bassoonist Richard Svoboda gave the premiere of Marc Neikrug’s Bassoon Concerto, under the baton of Rafael Frühbeck de Burgos. A work co-commissioned by four orchestras, and requested by several bassoonists, Neikrug’s concerto is cast in a classic three movement arc (fast-slow-fast) lasting some 20 minutes. As the composer describes in his own program note, he grew interested in the “idiosyncratic” properties of the bassoon, including its ability to negotiate large leaps in pitch. Playing with such leaps appears to be the thrust of the first movement. Showing off the bassoon’s ability to swing rapidly back and forth between two pitches — known as “shakes” — is the thrust of the finale. The wistful slow movement, the most appealing of the three, taps the instrument’s ample lyrical possibilities. Throughout the work, Neikrug’s orchestral writing gives a wide berth to the solo line, so wide in fact that the piece on Thursday felt on occasion a bit spare. Meanwhile, its derivation of thematic material from the bassoon’s own instrumental bag of tricks has an organic appeal, but also left the ear wishing at times for a bolder and more personalized specificity of sound world. For his part, Svoboda dispatched the piece with abundant technique and musicality, bringing a striking tonal warmth and richness to the middle movement and over all, making the most of his instrument’s rare moment in the sun. Frühbeck de Burgos has grappled with health issues in recent years but his conducting remains vigorous, and on Thursday he managed two-thirds of the program standing, and sat only for the concerto. This is burstingly colorful music he leads with a rhythmic flair and interpretive authority that is hard to beat. And if this was not always the tidiest performance, the orchestra did not stint on virtuosity or style.